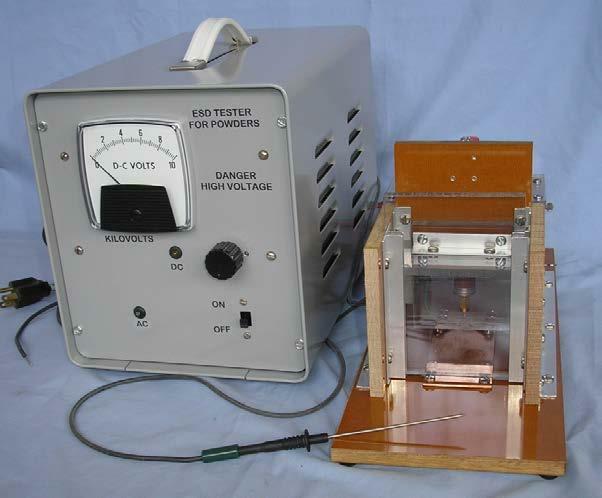 The purpose of this apparatus is to test sensitivity of certain powders to electrostatic discharge (spark). A charged electrode is lowered into the material under test. Technicians will use this tester on energetic powders, such as pyrotechnic material or metallic powders, i.e., zirconium and aluminum. It is possible for human beings or other things to acquire an electrostatic charge of considerable magnitude just from normal activity. Low humidity conditions usually increase the maximum charge retained. The charge is often discharged in the form of a small spark to ground. Because it is possible that any energetic material may be exposed to such a discharge, the determination of electrostatic sensitivity is important.